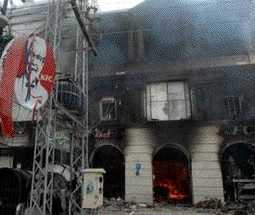 They Are Burning Western Embassies All Over the World. Is There Any Doubt That We Are At War...With Islam? No one wants to say it. But we are at war, folks. And the enemy isn't extremism or extremists. Those out there burning Danish embassies all over the world and now have attacked a British and a German embassy (hattip: Michelle Malkin), obviously are at war with us, the Western world over the cartoons. 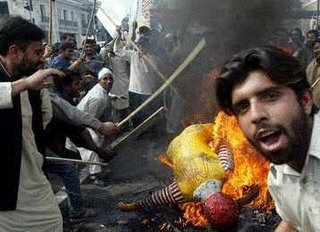 Ronald MacDonald and Colonel Sanders are American icons, not those of Denmark and those battering and burning are Pakistanis, not Danish Muslims. It should be obvious that Islam and Muslims declared war on us. We are so proud that Winston was half American. Not only is it important to name the enemy (Islam), but it is important to do something else that has not been done - to formally and officially declare war. We haven't declared war officially since WWII. A formal declaration of war carries with it enormous legal consequences, and would solve a lot of the problems we face today. An official, formal declaration of war is just something else that we have lost to Political Correctness. Very well texted. We are not in a war against "terror", because "Terror" is the tool of the enemy. That enemy would be Muslims following the teachings of Islam to the letter.